Good news for Open Source Lovers! Facebook has open-sourced Hack Codegen – its library for automatically generating Hack code, allowing outside developers to automate some of their routine work while developing large programs. HACK is the Facebook's own programming language designed to build complex web sites and other software quickly and without many flaws. HACK programming language is developed for HipHop Virtual Machine (HHVM) – an open-source virtual machine designed to execute programs written in Hack and PHP. The top 20 open source frameworks on Github run on HHVM. "Being able to generate code through automated code generation allows [developers] to increase the level of abstraction by making frameworks that are declarative and that are translated into high-quality Hack code." "We've been using Hack Codegen at Facebook for a while. After seeing so much internal success, we open-sourced this library so that more people could take advantage of it." Before Hack Codegen, Facebook engineers used concatenating strings to generate code that perform simple yet frequently executed tasks, like fetching birthday of a user. However, the social media giant later discovered that the technique was not good enough to scale up and realized that it need a good library to generate code. This results in the birth of Hack Codegen. 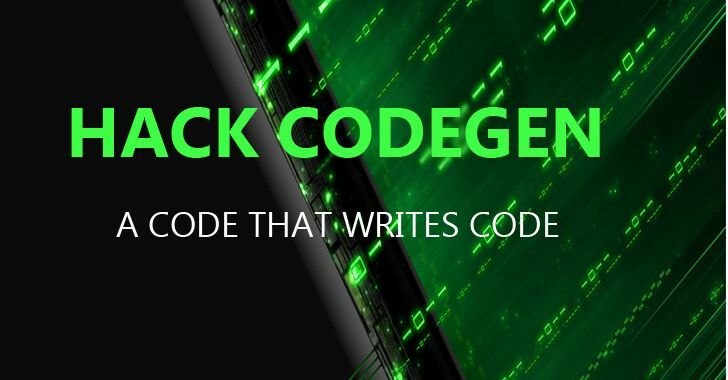 Hack Codegen simplifies code generation by helping developers create a schema, which holds code for multiple times usage, and a way to generate all the related functionality required to support that code. The library only needs a developer to provide the required details about the particular implementation, although rest of the task is done by the software, such as generation of classes, variables, methods, functions, interfaces, files, and other standard blocks of code. The open-source version of Hack Codegen is available on GitHub.